The biocapacity of the Earth and the ecological footprint can be expressed in a common unit called a global hectare (gha). Gha measures the average productivity of all biologically productive areas (measured in hectares) on Earth in a given year. Measures of gha have been steadily declining. Both population and the average per capita footprint have increased since 1961. The available biocapacity per person has nearly halved in the same time. Since the 1970s, humanity’s annual demand on the natural world has exceeded what the Earth can renew each year. The Ecological Footprint tracks humanity’s demands on the biosphere. Over the last several decades, there is clear evidence of a consistent trend of over-consumption. At current levels, it takes 1.5 years for the Earth to fully regenerate the renewable resources that people are using in a single year. If everyone lived like an average resident of the U.S., a total of four Earths would be required to regenerate humanity’s annual demand on nature. The per capita Ecological Footprint of high-income nations dwarfs that of low- and middle-income countries. The Living Planet Index for high-income countries shows an increase of 7 per cent between 1970 and 2008, while the index for low-income countries has declined by 60 per cent during the same time frame. The growing levels of greenhouse gases will only worsen as there are less forests and other vegetation to absorb the rising levels of greenhouse gases. This will lead to faster rates of climate change and ocean acidification. These impacts will further erode biodiversity and undermine the resources on which people depend for their survival. The amount of forest land needed to sequester carbon emissions is the largest component of the Ecological Footprint (55 percent). The carbon storage service provided by the world’s forests is vital for climate stabilization. The rapid degeneration of tropical forests is particularly destructive given that tropical forests store the most carbon. Almost half of this above-ground carbon is in the forests of Latin America, with 26 per cent in Asia, and 25 per cent in Africa. Forests are being cleared and degraded through human activities, this not only deprives us of a carbon sink, it actually releases greenhouse gases, especially CO2, into the atmosphere. Globally, around 13 million ha of forest were lost each year between 2000 and 2010. Deforestation and forest degradation currently account for up to 20 per cent of global anthropogenic CO2 emissions – the third-largest source after coal and oil. This makes forest conservation a vital strategy in global efforts to drastically cut greenhouse gas emissions. Freshwater ecosystems occupy approximately 1 percent of the Earth’s surface yet are home to around 10 per cent of all known animal species. Rivers provide services that are vital to the health and stability of human communities, including pollution control, fisheries, water, navigation, trade, detoxification and hydrological flow. But numerous pressures, including land use change, water use, infrastructure development, pollution and global climate change combine to erode the health of rivers and lakes around the world. The rapid development of water management infrastructure – such as dams, dykes, levees and diversion channels – have left very few large rivers entirely free-flowing. Of the approximately 177 rivers greater than 1,000km in length, only around a third remain free-flowing. Free flowing rivers sustain a wealth of natural processes such as sediment transport, nutrient delivery, migratory connectivity and flood storage. The world’s oceans supply fish and other seafood that form a major source of protein for billions of people. Oceans also provide seaweed and marine plants used for the manufacture of food, chemicals, energy and construction materials. Marine habitats such as mangroves, coastal marshes and reefs form critical buffers against storms and tsunamis and store significant quantities of carbon. Some of these habitats, especially coral reefs, support important tourism industries. Further, ocean waves, winds and currents offer considerable potential for creating renewable energy supplies. Oceans offer a wide range of benefits from food production to property protection; however they are being threatened by overexploitation, greenhouse gas emissions and pollution. Over the past 100 years, the use of our oceans and the services they provide has intensified. We are currently engaged in unsustainable fishing and aquaculture and we are exploiting offshore oil and gas as well as engaging in seabed mining. Perhaps the most dramatic visible impacts have been on the world’s fisheries. A nearly five-fold increase in global catch, from 19 million tonnes in 1950 to 87 million tonnes in 2005, has left many fisheries on the verge of collapse. Overfishing has radically reduced the numbers of large predatory fish like marlin, tuna and billfish. What we have done to the top of the marine food chain has had repercussions all the way down to the bottom. The near extirpation of top predators has significantly increased the numbers of smaller marine animals, which has in turn led to a reduction of algae and undermined coral health. The report indicates that there is still time to reverse current troubling trends. It starts with making better choices that place the natural world at the center of our economies. This translates to eco-conscious business models and environmentally sensitive lifestyles. As stated in the LPR, “nature is the basis of our well-being and our prosperity.” Therefore, to preserve the foundation of all human economies, ecosystem services must be preserved and where necessary, restored. In order to reverse the declining Living Planet Index, the collective ecological footprint must be brought within the Earth’s carrying capacity. The only way we can do this is if we produce more with less and consume better and wiser. The report concludes that we can create a prosperous future that provides food, water and energy for the 10 billion people that are expected by 2050. But to avoid dangerous climate change and achieve sustainable development we need to embed a fundamental reality into the way we think about our economies, business models and lifestyles: All our endeavors must pay heed to the fact that the Earth’s natural capital is finite. We must reduce greenhouse gases and decouple human development from unsustainable consumption (moving away from material and energy-intensive commodities). High income countries must conserve healthy rivers, lakes and wetlands to ensure that poorer countries have access to water. We must also use water more efficiently including smarter irrigation techniques and better resource planning. We must strive to meet all of our energy needs from clean and abundant sources like the wind and the sun. But the first imperative is to cut our energy usage in half through greater efficiency in our buildings, cars and factories. Other solutions proposed by the LPR include better waste reduction, better seeds and better cultivation techniques. 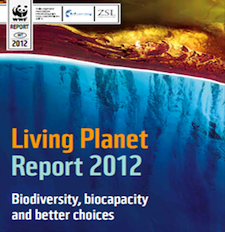 The report also advocates restoring degraded lands and changing diets (lowering meat consumption). Preserve the Earth’s biodiversity and restore key ecological processes necessary for food, water and energy security, as well as climate change resilience and adaptation. Make production systems that lower humanity’s ecological footprint to within the limits of the Earth’s carrying capacity. This entails significant reductions in the use of land, water, energy and other natural resources. Make global consumption patterns conform to the Earth’s biocapacity. Stop the short term profit focused thinking that leads to over-exploitation of resources and to the destruction of ecosystems. See the very significant long-term benefits of protecting natural capital. Establish equitable resource governance to shrink and share our resource use so that it conforms to the Earth’s regenerative capacity. In addition, sustainable efforts should be made to promote health and education, as well as improve access to food, water and energy. Finally, we need a new definition of well-being and success that includes personal, societal and environmental health.